In a stunning display of judicial activism that overturned federal and state campaign laws dating back to the early 19th century, the narrowest Supreme Court majority held that corporations have a constitutional right to use their treasury funds to make so-called “independent expenditures” supporting or opposing candidates for public office. The Communications Workers of America and the United Auto Workers are deeply troubled by the court’s recent 5-4 decision in Citizens United v. FEC. In our judgment, this misguided decision poses a fundamental threat to our democracy and our nation’s ability to pursue policies that will benefit ordinary Americans, rather than just the wealthy, powerful elites. The Citizens United decision will allow corporations to dominate the political process, just like they are able to dominate the workplace, undermining laws that are supposed to protect worker bargaining and organizing rights. The Supreme Court’s latest decision is based on two highly dubious propositions. 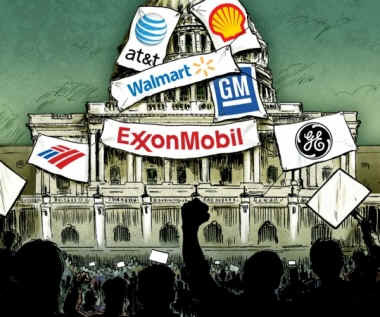 First, the majority opinion simply asserts that corporations have the same First Amendment rights as individuals. This assertion has no basis in either the literal language of the Constitution or the statements of our Founding Fathers. As the dissent notes, “corporations have no consciences, no beliefs, no feelings, no thoughts, no desires.” And corporations don’t have other important rights that the Constitution confers on individuals, including the right to vote or to be counted in the census that forms the basis for apportioning representation in Congress. Second, the majority opinion argues that as long as corporate campaign expenditures are “independent,” there is no danger of corruption or even the appearance of corruption of elected officials because there cannot be any “quid pro quo” arrangements. This is magical thinking. Given the intertwined connections between political operatives, the reality is that such expenditures are seldom truly “independent.” Through their political consultants, corporations will be able to scope out what type of ads would be most helpful to the candidates they are supporting — or most damaging to the candidates they want to defeat. Even if the expenditures were “independent,” however, public officials still would be influenced by the prospect that a corporation might spend millions on TV ads supporting or attacking their reelection. Public officials will hesitate to cross corporate lobbyists for fear they will become the target of a barrage of unflattering TV ads. For those officials who do toe the line, they will inevitably feel beholden to corporations who spend freely on positive ads to advocate their reelection. One need look no further than the infamous “Swift Boat” ads for proof that so-called “independent” expenditures can have an even greater impact than direct contributions. Thus, the practical impact of the court’s decision is that corporations will be able to use the millions in their treasuries to exert massive pressure on elected officials to support policies beneficial to them. These players with the deepest pockets will be able to pay premium prices for as many ads as they want, easily dominating the airwaves. In political advertising, like all advertising, repetition is what works. So the end result is that corporate spending will dominate the political process. And the voices and interests of ordinary Americans will be lost and their faith in representative democracy undermined. Congress should act promptly to prevent this corporate coup d’etat. This should include holding hearings to document the corrosive impact that independent expenditure campaigns are likely to have on decision-making by public officials, as well as the questionable “independence” of such campaigns. Congress also should look to impose new requirements on corporate independent expenditure campaigns, such as shareholder approval and tougher disclosure and accountability measures. And it should still seek to prohibit government contractors and foreign corporations from engaging in such independent expenditure campaigns. More sweeping reforms are needed to free candidates from their dependency on wealthy special interests by restoring our system of public financing in presidential elections and establishing public financing for congressional elections. Ultimately, the best solution would be to ensure that any future vacancies on the Supreme Court are filled with justices who will reject the misguided judicial activism in Citizens United, and instead restore the longstanding principles that protect the right of individual Americans to a free, honest and participatory government by preventing corporate wealth from dominating our political process.